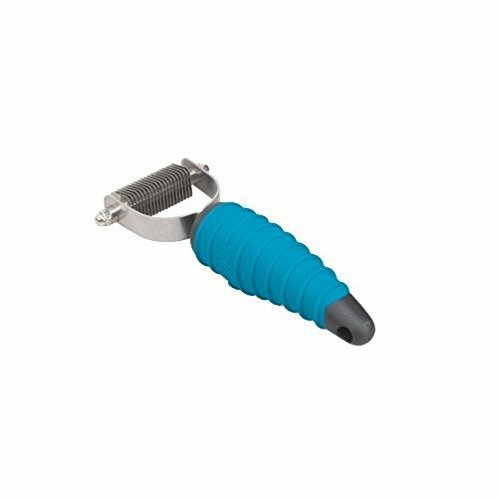 Our ergonomic Grooming Strippers remove loose hair and thin out undercoats quickly and easily. Specially designed curved blades are made of hardened stainless steel with rounded ends for safety. Strips coats cleanly and effectively, leaving coats and skin healthy.Contoured, ribbed rubber handles fit comfortably and securely in the hand for better control and comfort. Use the 8 Blade, 10 Blade and 12 Blade for extra thick through medium textured coat. Use the 16 Blade for prep work and thinning. Use the 20 Blade for soft, fine coats.Rake through the coat to remove the undercoat, to demat, thin coat, or create a hand-stripped or carded look on terriers or sporting breeds. For best results, and to avoid removing excessive top coat, use only in the direction of hair growth. Each tool measures 6 1/2 L and comes blister packed for safe shipping. Size: 6 1/2 LAlso Available in Professional Bulk Pack - Includes All 5 Strippers!